Your sideburns are an important part of your look. Whether you're tapering, straightening or trimming them, uniformity on both sides is essential. Your Wahl trimmer is perfect for the job but your Wahl clipper can handle it, as well. Grow your beard for one to two weeks. As your sideburns become more visible, use your Wahl trimmer to create a lower border at your desired length by trimming a defined, horizontal line at the bottom. This line should be somewhere between your ear lobes and your chin to achieve the flared appearance. Shave your neck, chin, and mustache clean. If you prefer a blocked shape, trim an angled line from the top of the sideburn to the wider bottom edge. 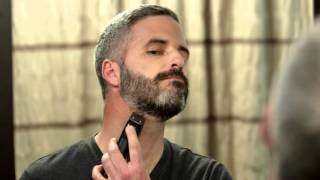 If you would like a swooping curved design, use a Wahl trimmer to create a sloping line from your ear to the tip of your sideburn that follows the natural upper border of your beard.